Congrats to the Photo Contest Winners! The Saskatchewan Environmental Society has announced the winners to their recent Radiant Rivers photography contest, held in clebration of World Rivers Day (September 25th). Three first prizes were awarded, one of which was a gift certificate for kayak lessons from Coldspring Paddling Instruction. The winning photos from the contest are amazing. Check them out at http://www.environmentalsociety.ca/main/events/radiant-rivers-photography-contest/. Congratulations to all the winners. I look forwarded to having the recipient of the kayak lessons in one of my 2012 courses. Coldspring Paddling Instruction was featured this August in Shaw TV's program Big Summer. They interviewed Bryan and Marcus, one of the students. The course was taking place at Pike Lake. The Saskatchewan Environmental Society in honour of World Rivers Day, September 25th, is holding the Radiant River Photography Contest. Guess what one of the first prizes is? Kayak lessons from Coldspring Paddling Instruction! Coldspring Paddling Instruction is very excited to be involved in a contest which celebrates such an important part of a paddler's landscape and promotes the protection and value of rivers for all of us. 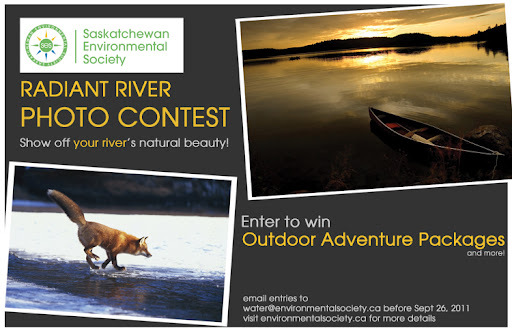 Check out the contest at http://www.environmentalsociety.ca/main/events/radiant-rivers-photography-contest/ for all the details and the rules. The contest closes on September 26th though, so don't delay! An agreement is in place between Coldspring Paddling Instruction and the Saskatoon Canoe Club to teach introductory sea kayaking lessons to SCC members for the 2011 season. Participants will have a choice of signing up for a 4-hour very basic course, or an 8-hour Paddle Canada certified Introduction to Sea Kayaking (IK) course. Coldspring Paddling Instruction is on Facebook. Join us there and click "Like" on our page in order to stay up date on the latest news and goings on at Coldspring Paddling. You can find our page at http://www.facebook.com/pages/Saskatoon-SK/Coldspring-Paddling-Instruction/191586540883067. The New Website Is Launched! Sign up for our e-mail list and stay up to date on the most recent news & course offerings! anyone considering taking up kayaking." "Thank you very much for the paddling instruction. We all thoroughly enjoyed the evening. Our son says that kayaking is AWESOME!" the best instructors I've ever had." Simply put, I love paddling. And I love to share that passion with others.